Christopher Mims’ piece Uber’s $18.2B Valuation Is a Head Scratcher is getting a lot of play, and deservedly so: it’s a good encapsulation of many people’s objections to Uber’s recent round that valued the company at $18.2 billion. Disruption is low-end; a disruptive product is worse than the incumbent technology on the vectors that the incumbent’s customers care about. But, it’s cheaper, and better on other vectors that different customers care about. And, eventually, as the new technology improves, it takes the incumbent’s market. This is not what happened in cell phones. 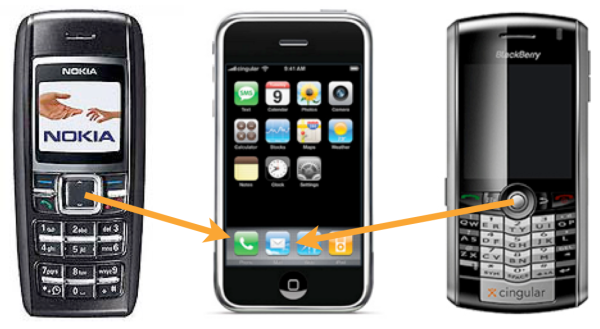 In 2006, the Nokia 1600 was the top-selling phone in the world, and the BlackBerry Pearl the best-selling smartphone. Both were only a year away from their doom, but that doom was not a cheaper, less-capable product, but in fact the exact opposite: a far more powerful, and fantastically more expensive product called the iPhone. Examples of obsoletive technologies include PCs, the Internet, search, and smartphones. All replaced multiples single-use tools with one (usually more expensive) single-purpose solution; more pertinently to this article, obsoletive technologies are huge opportunities, much greater in fact than disruptive ones (Read the original “Obsoletive” article here). Even the most aggressive estimates of Uber’s value — let’s assume the company captures 50% of the world taxi market in 5 years — mean the company would still be worth less than $18.2 billion…It’s quite possible that investors have wildly overestimated the ultimate size of Uber’s potential revenue. In both respects, Uber’s growth is reminiscent of Groupon, and we know what happened to them. This was, in fact, what I predicted long before Groupon’s IPO: that while Daily Deals would be commoditized, there would always be an advantage that would accrue to the market leader based on brand and consumers’ willingness to tolerate managing multiple options (honestly, how many Daily Deals emails are too many?). After all, there are entire industries – consumer packaged goods, especially – built on the idea that, in the consumer market, commodities can be sustainably differentiated by brand, channel, distribution, etc. (Be right back – I’m going to snack on some Ritz crackers). Similarly, while the truly cost conscious may manage multiple ride-sharing apps, most will default to one, and in that case, the market and brand leader has a clear advantage (just like every branded item in your local grocery store). The problem with Groupon was the entire premise of their business; in short, daily deals were a terrible deal for small businesses, which meant the cost of getting more daily deals eventually became prohibitive (Groupon’s sales force costs were through the roof). In this respect, Uber stands in stark contrast: drivers are getting a great deal with Uber (and Lyft and all the other competitors). In other words, I believe Groupon lost most of its valuation because it had a crappy value proposition for its core constituency, not because it faced too much competition. If I’m right, and Uber v Lyft plays out the same way as Groupon v LivingSocial, then only Uber will be left standing (a la Groupon), but standing on top of a much healthier industry (unlike Groupon). At this point Mims could justifiably argue that Uber as logistical network or differentiated brand are simply pie-in-the-sky fantasies that pale in reality to today’s market. And that would be a fair thing to say if Uber were a public company and $18.2 billion were their market cap. But, in fact, $18.2 billion is a valuation used in a venture round, and that has entirely different implications. Venture capitalists are not buying stock per se, but rather mis-priced optionality. In the case of Uber, $18.2 billion valuation is the result of a $1.2 billion investment; for the investors ponying up the cash, their downside is capped at $1.2 billion (and likely much less, given that Uber’s valuation will never go to zero, and that investors get preferential treatment in a below valuation exit). The upside, though, is by definition infinite, because Uber’s valuation has no theoretical limit (again, the bottom limit is $0). Again, in an extremely pessimistic scenario in which Uber has only a 10% chance of realizing its potential, investors in this latest round will still make their money back. There isn’t that much downside, and the upside is enormous. Opportunities like this investment round are the entire premise of venture capital, and the valuations that result just aren’t that analogous to public market valuations, at least in the short term. I don’t particularly like picking on individual writers or articles, and there’s a non-zero chance that Mims ends up being right – I still have friends giving me grief for being bullish on Groupon. However, even there I think my reasoning was sound: you can differentiate in consumer markets with low barriers to entry. Add that to the obsoletive nature of Uber’s product, along with an understanding of how venture valuations work, and $18.2 billion ends up looking downright reasonable.